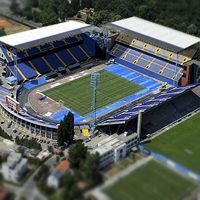 Without improvement in stadium infrastructure Serbia may be forced by UEFA to play outside the country. 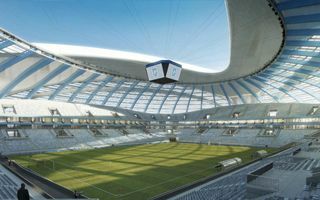 Also, if the country seriously hopes to snap a place among 13 hosts of Euro 2020, national stadium needs to become more realistic, Telegraf.rs reports. 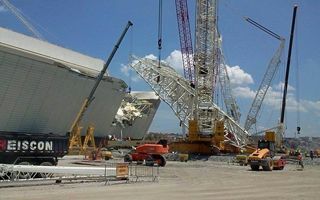 After two months the tragic accident site at Arena Corinthians was cleared yesterday. Now work is to resume in this part of the construction, expected to end in April. Liverpool City Council has published a consultation document for the planned £260m regeneration of Anfield. 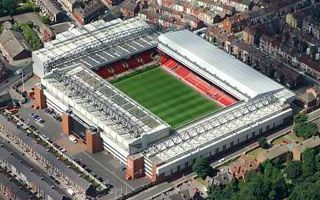 Plans to extend Anfield stadium to a 55,000 capacity ground are at the heart of the wider regeration proposals. A ConstructionEnquirer.com report. 31.01.2014 Madrid: This is Bernabéu 2017! 15 months after the selection of four finalists, Real Madrid finally announced winners of the international competition. As predicted, German GMP Architekten won with their bid. 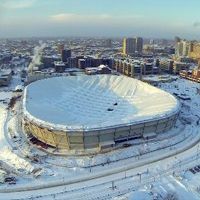 In half a year we should see the old stadium's demolition commence, while in October construction works on new Stadionul Ion Oblemenco are to begin. Unfortunately the project has been downscaled, leaving the impressive renderings only a memory. 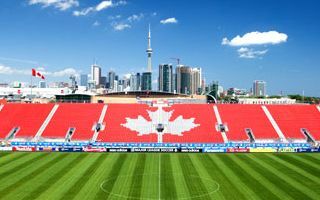 It seems BMO Field is about to grow, providing that Toronto FC owners convince the city to approve of the upgrade. 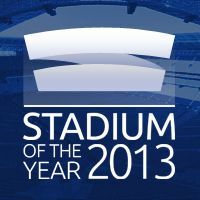 Not only 50% bigger, the stadium would get a new roof and possibly a new tenant, this time in American football. 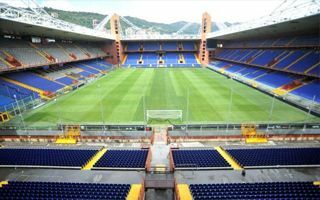 Yesterday saw the city council vote in favour of establishing a municipal entity to operate the stadium built for the 2010 World Cup. Last-minute effort to give it away was dropped. 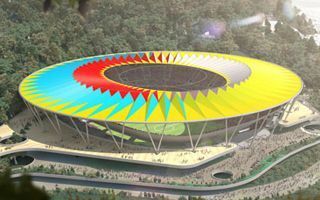 Like the colourful feathers of Indian panaches, the vast membrane roof of new national stadium of Venezuela will encircle spectators. 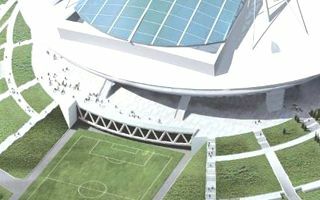 The 55,000-capacity giant in Caracas is to be literally incorporated into a hillside. 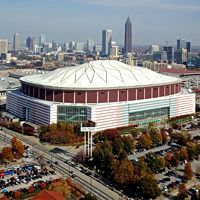 While the stadium is still hugely delayed, the selection of mobile field technology is anticipated in February. Final cost has yet to be established, according to Karpovka.net. 28.01.2014 France: Lens homeless next season? 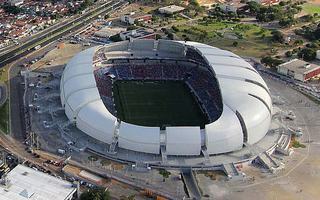 Yesterday saw the very first game at Arena das Dunas. There's still work to be done ahead of the 2014 World Cup, but launching into operation went very well. Apart from attendance, because the stadium was half empty. 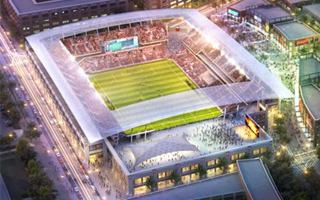 27.01.2014 Washington: Citizens against the new DC United stadium? Recent poll by Washington Post suggests that for every enthusiast of the planned football stadium there are two opponents. Almost 60% don't think engaging public money in this project is a good idea. 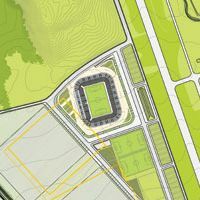 Waldemar Kita, owner and president of FC Nantes, appealed to the municipality to engage in building a new stadium for the club. Earlier he asked to consider also a revamp of the current venue. Supporters aren't willing to accept a new one, though. Info-Sades.fr report. 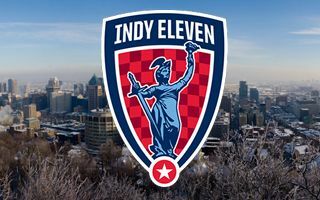 It's not another MLS expansion yet, but why wait so long – says Ersal Ozdemir, founder of Indy Eleven. 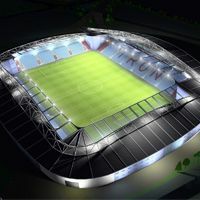 His plan of building a new 18,500-capacity stadium is already underway, though the club hasn't even played its first game in the second league. 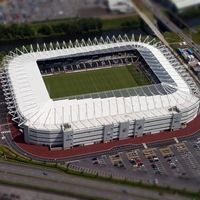 Premier League's smallest stadium has just gained the approval of Swansea City council to grow to some 33,000. The only thing that can stop the ground from reaching the projected size now is... McDonald's. 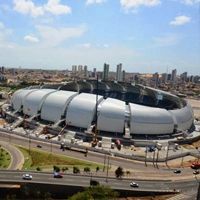 Late Wednesday afternoon saw officials celebrating the opening of Arena das Dunas in Natal, seventh stadium ready for the 2014 World Cup. Except that it's not ready just yet and politicans also had to bear hundreds of protesters outside, kept there by military police. After numerous appeals from supporters, Partizan is now replacing all seats at the stadium to new ones in club colours. The project is done with Carlsberg breweries, who are to receive an advertising sign made of the seats in return. 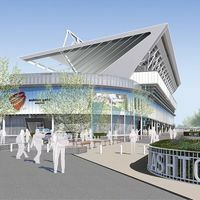 23.01.2014 Bristol: Decision made, Ashton Gate remodelling starting in May? If no-one officially objects within 6 weeks, complete redevelopment of the existing Bristol City stadium will begin already this Spring. The project worth £40 million will raise capacity to almost 27,000 and provide new facilities. 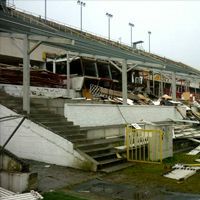 Removal of the collapsed part of the roof began, while additional, temporary stands are under construction. 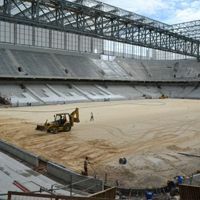 Overall the stadium is said to be 97% ready. 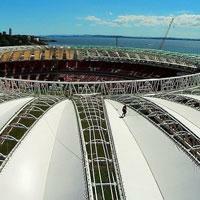 FIFA assured the opening game will be held at Arena Corinthians. When first opened, it had 66,000 seats. 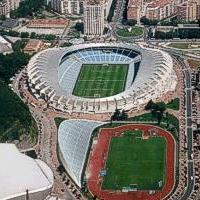 Then the capacity was increased twice and now exceeds 71,000 for domestic games. 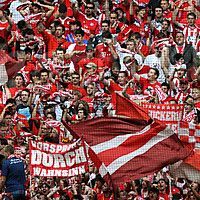 Before next season another 4,000 are expected by Bayern. 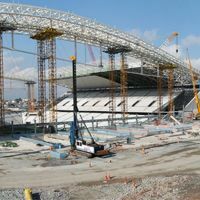 Though it's Sao Paulo that saw crane falling onto the stands, Curitiba's redeveloped Arena da Baixada is now the most delayed stadium of the 2014 World Cup. 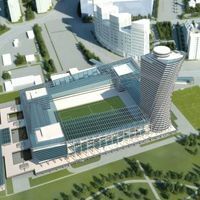 Today FIFA questioned the construction pace and threatened to drop the city, unless delivery is guaranteed by February 18. 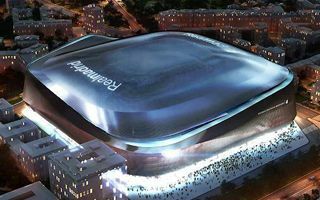 Europe's largest stadium will be redeveloped by 2021. The board of directors unanimously rejected the option of building a brand new stadium. 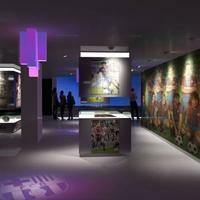 It proved too expensive, but Camp Nou's revamp will also require a huge effort! 20.01.2014 Pyrotechnics: How will the Swedish debate end? 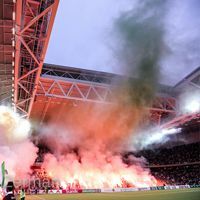 It's almost a year since Sweden saw its major conference devoted to pyrotechnics at sports games. The debate goes on and seems to be closing to a final. Would this mean legalisation? It's not ruled out for sure. 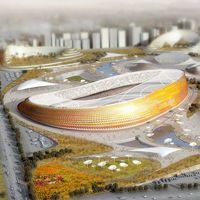 Groundbreaking will take place before the end of 2014 – an official confirmed today, assuring the stadium will be ready well ahead of the 2018 World Cup in Russia. 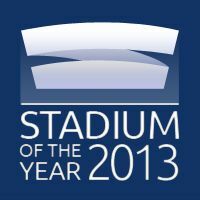 20.01.2014 Stadium of the Year 2013: Last call for nominations! After 32 years it's no longer a piece of Minneapolis skyline. The pneumatic roof of Metrodome was deflated yesterday as demolition of the stadium is nearing. 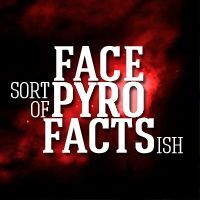 18.01.2014 Pyrotechnics: Norway, the promised land? 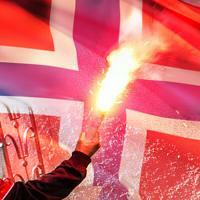 Last year began with difficult news for Norwegian fans – pyrotechnics were partly banned after two years of legal use. This year it's not the case, Norway remains Europe's most liberal country regarding the use of 'pyro'. 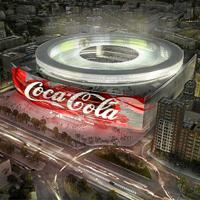 17.01.2014 Madrid: Coca-Cola to get Bernabéu naming rights? After revelations about Microsoft, now it's time for Coca-Cola to be named as potential sponsor for Real Madrid's revamped stadium. Supposedly the deal might be worth a stunning €80 million per year! 17.01.2014 Barcelona: Giant necropolis under Camp Nou? 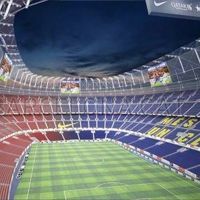 Whether at the revamped Camp Nou or completely new stadium, there will be room for 30,000 urns for those wanting to 'bond for eternity' with FCB. This is expected to be the world's largest stadium-based cemetery. It was supposed to open exactly today, but slight delays caused the family festival to be postponed until January 23. 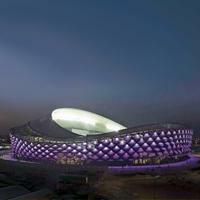 Still, we decided to give you the pre-premiere view of Hazza Bin Zayed Stadium today, it's absolutely worth the rush! 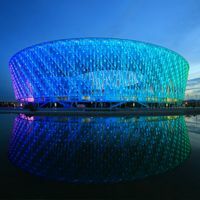 Two Euro 2012 stadiums are being discussed over their use of night-time illumination. 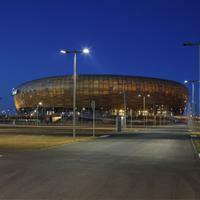 The amber-bowl in Gdansk is blacked-out to cut costs, while National Stadium's white-red facade is used as Warsaw's largest advertising space. O'Hare and McGovern will soon have a football stadium in their portfolio as the company were announced as general contractors for Northern Ireland's national stadium redevelopment. Belfast Telegraph report. After years of stalemate finally most of the financing is secured. 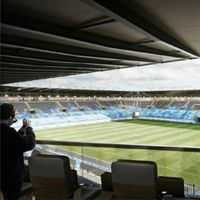 Remodelling of famous Estadio Anoeta won't be as impressive as planned a decade ago, but it's going to make the stadium a proper football-specfic one. 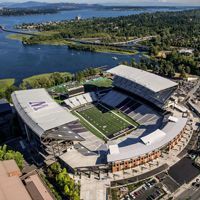 Most expensive stadium currently under construction in the US will see one of the largest parking spot numbers in the world. 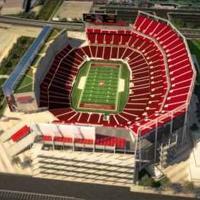 Over 30,000 spaces are to be available for every event at Levi’s Stadium. 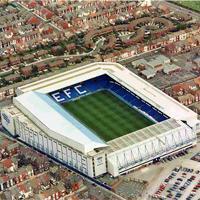 The relocation to Kirkby didn’t work, renovation and expansion of Goodison would probably become too much of a hustle. What now? The club confirms it’s working closely with the council to build a new stadium within Liverpool boundaries. 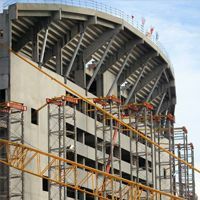 This unique roof isn’t completely ready yet, but Estadio Beira-Rio already has all 65 membrane segments mounted over the stands. Each of them resembles a palm leaf. In a smart, simple and almost funny way the Premier League wants to drive people away from lighting flares at football games. And though its campaign caused a lot of irony and criticism across Europe, English fans support it. Vast majority just doesn't see flares as part of their culture. 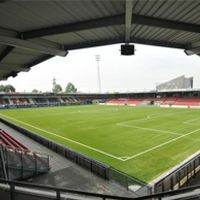 Heracles Almelo won't see their bold stadium plan come to fruition. 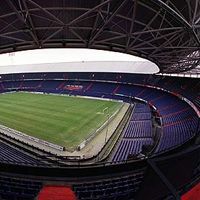 The club now abandoned the 15,000-capacity project in favour of complete renovation and expansion of Stadion Polman. 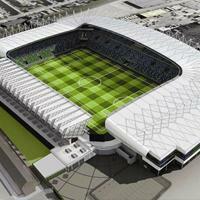 13.01.2014 Saint Petersburg: Zenit tired of waiting for new arena, planning their own stadium?! 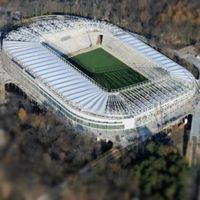 As the public-financed new 69,000-seater goes into 6th year of delays, news of Zenit planning a ‘plan B’ modular stadium was released in… Germany. Only after it leaked, the club decided to comment on the issue. 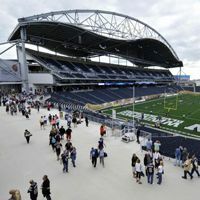 The company that built Investors Group Field has claimed ownership of the facility until $1.9 million is paid up, according to Winnipeg Sun. 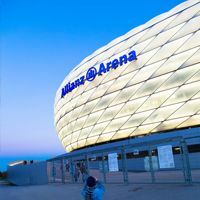 Stuart Olson Dominion has placed a lien against BBB Stadium Inc.
12.01.2014 Nuremberg: Naming rights owner to satisfy fans with new stadium name? 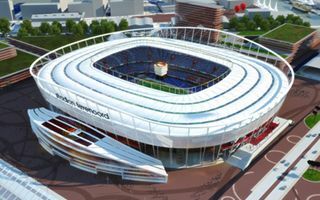 In three years the naming rights deal with Grundig is over and Grundig Stadion will be no more. 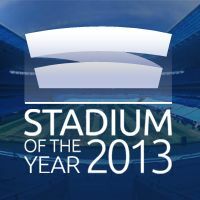 How would the new stadium name sound? 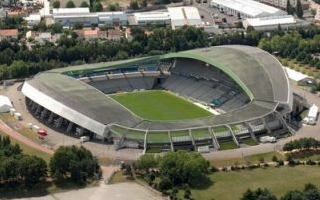 Perhaps Max-Morlock-Stadion, as fans have been appealing for years? New sponsor is willing to leave name up to fans. This is just one step forward for this project, but a very important one. 23 locations have been eliminated and one final plot selected for the new stadium. Completing it may be a matter of survival in the Bundesliga for SC Freiburg in the long run. 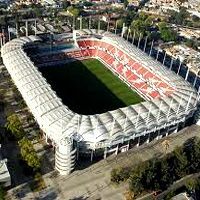 They financed the stadium themselves, but now their club isn’t even host any more. They’re guests at their own home and are outraged about it. 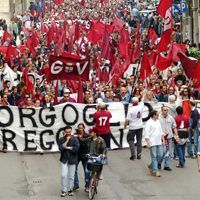 Today they took to the streets after weeks of other protests. On one hand it’s what the club describes as “small thank you” gesture. On the other, it’s another argument for those criticizing skyrocketing ticket prices at Arsenal, who reportedly have the world’s most expensive away section. 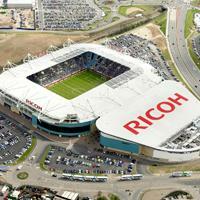 New 20,000-capacity stadium has both the planning permission and contractor. 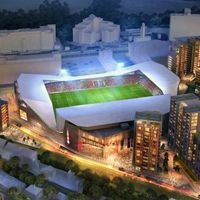 All indications suggest that Brentford FC may in fact be the first London-based club after Arsenal to have a new stadium, though others began their attempts much earlier. It’s been over 20 years since the old stadium in Brasov was to be changed. In the meantime it was closed, then demolished and still no new stadium was built. That should soon change, because funding is finally secured. At least partly. 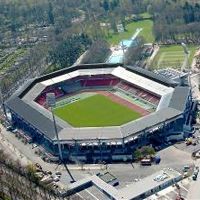 Three kilometers south of the Red Bull Arena a much smaller stadium is located, the MyPhone Austria Stadion. This is where Austria, club ruined by the energy drink giant is being rebuilt step by step by its fan community. 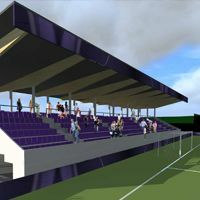 Now they presented expansion plans for their home ground. 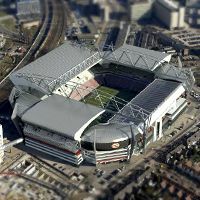 It’s either a huge expansion of Philips Stadion or a brand new stadium outside city centre. Whichever option is found best by PSV Eindhoven, the long term plan is to grow by at least 40% in terms of available capacity. The time frame for this stadium was always a very tight one. However, not only will the contractors meet all deadlines, but even finish earlier. The 20,000-capacity new arena is to begin tests in early April to host its first event already one day after construction formally ends. 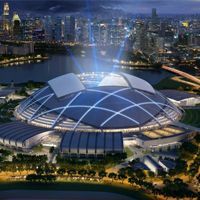 08.01.2014 Singapore: ‘Causeway derby’ to open Sports Hub? Singapore and Malaysia are just meters away from one-another, connected with a causeway. I a few months they may clash both on the pitch and in the stands of world’s largest dome. 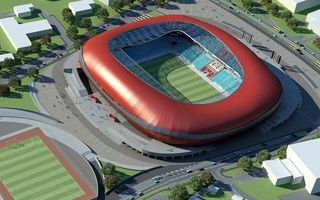 Huge quarter in eastern Addis Ababa is being cleared to make way for construction of the new 60,000-seat national stadium. 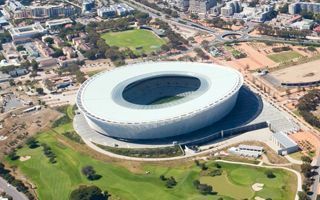 This is the very largest sports project in this part of Africa in decades. His monument in front of Estádio da Luz has been covered in scarves and flowers since yesterday, when fans first heard of their legend’s passing. 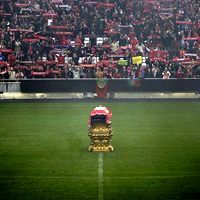 Today Eusébio took his last round of honour and the coffin was placed in the Centre of the stadium, accompanied by applause, chants and pyrotechnics. 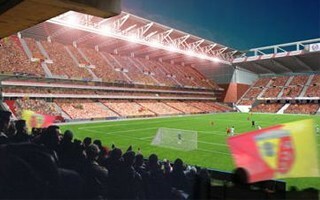 It’s been confirmed in December and already now we see how the desired new ground of The Iron should look. 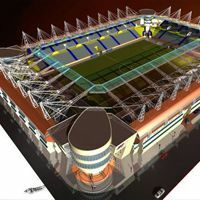 Of course these are initial renderings, but the aspirations of the League Two side are admirable! One from Wallonia, one from Flanders. 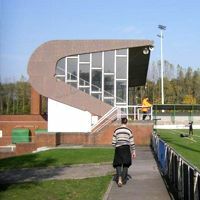 The two latest additions to our Belgian stadium list were brought to you thanks to groundhopping trips by Stephan Hoogerwaard! 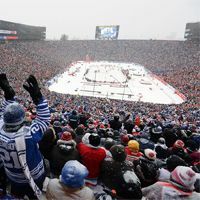 Another giant winter hockey game behind us at Michigan Stadium. Now the question on everyone’s mind is how many people actually showed up to watch it. If the number is close to the amount of tickets sold, we may have a new record for any hockey game in history. We’ve summed up what was best and worse in 2013, now it’s time to get a plan for 2014. 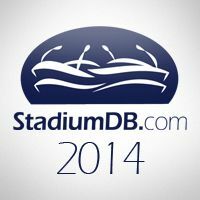 We’ve got ours and want to know, what would you like to see at StadiumDB.com as well. 2013 ended in an unexpected way for many citizens of Brazilian Natal. 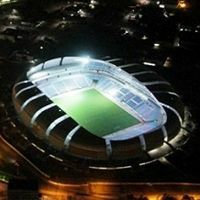 2 hours before midnight on New Year’s Eve all lights at Arena das Dunas were lit in the very first test ahead of upcoming opening. 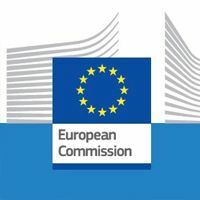 The Commission is running a Europe-wide investigation into public aid regarding sports infrastructure. 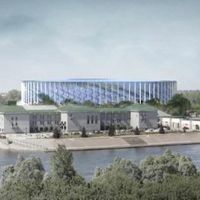 After clearing financial schemes in France, Belgium and Hungary, more countries are now seeing their projects examined. Baylor University announced it would name its new football stadium after one of the most distinguished alumni families in history. 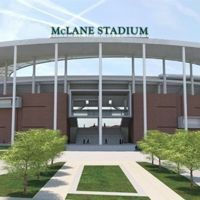 The name McLane Stadium honors Drayton McLane Jr. and his family's continuing generosity to the University and lengthy history of service to Baylor.